Dragging yourself across the Irish countryside without the use of your legs can do wonders for your upper body strength, but Vikings actor Alex Høgh Andersen avoids bragging about his fitness. The Danish actor makes a big impact in “Vikings” midseason, which debuts at 9/8c Nov. 30 on History. His magnetic performance as Ivar the Boneless, Ragnar Lothbrok’s youngest son by Queen Aslaug, effortlessly swings from menacing to vulnerable, revealing a new anti-hero for the Viking Age. Born without the use of his legs, Ivar battles every day to be seen as the equal of his brothers—Ubbe (Jordan Patrick Smith), Hviserk (Marco Ilsø) and Sigurd (David Lindstrom). He may not get around Katteget as quickly as his brothers, but he gets there through force of will. He also trains with them, learning to sword fight, shoot arrows and throw an ax from a seated position. Ivar uses his wit, cunning and an ability to scare the tattoos off a Viking beserker to achieve his goals. Remember when, as a child, Ivar hacked another kid in the head with an ax just to get a ball? He hasn’t lost those sociopathic tendencies. Andersen, 22, says he is excited to bring such a “badass” to life because it is rare on TV to have a person who cannot walk—and doesn’t have the use of a wheelchair—as a main character. Andersen and I spoke over the phone about Ivar, the challenges of acting with the use of only your upper body–and that interesting hair cut. Are you in Ireland right now? I’m in Dublin right now. I’m sitting in my apartment. I just came home from work. It was a small day today, actually—we only had eight hours or something like that. Usually it’s 13 or 14. Good, you can go out and party now, right? Well, I’m on my way. I better hurry and get through these questions then! I just love the way Ivar is so frightening but then so vulnerable. Thanks. That’s the main focus and that has been the focus since we started a year-and-a-half ago. It’s that “anti-hero” in a way; that’s really what it is. And I got some inspiration from Walter White in “Breaking Bad,” and a little bit of Frank Underwood from “House of Cards” as well. In history, Ivar is absolutely mental and horrible and violent. To keep him attractive to the audience, we needed to create some kind of a human side for him. Finding that balance between being inhuman and human—that’s where my job as an actor gets really, really interesting. It’s great to have that kind of a dialogue with Micheal Hirst. We’re able to have creative freedom and a dialogue [about our characters] on “Vikings.” That is huge. It’s massive. We [the actors] are very spoiled—all of us—to work on a TV show that takes us seriously. The producer isn’t in the corner saying, “You didn’t say your line like it says in the script. Would you please do that the next time?” That’s not happening and it’s lovely. What do you love about Ivar, about his personality or story? I love the fact that he chose to fight his disease every single day, instead of just accepting his fate, so to speak. He chose to crawl around every single day and to be very independent. I think that is absolutely extraordinary. Everybody could learn from his example. I really respect him for that, and I thank him for that because that makes my job so much more interesting. As Ivar, you drag yourself around a lot in the new season. How strong is your upper body right now? [Laughs.] Well, I mean, they set this up for me a lot in the beginning. When the other brothers and Travis and I arrived a year-and-a-half ago, they got us a personal trainer who literally killed us every single day for four weeks straight. Ever since, we’ve been taking care of ourselves. I’m a bit more challenged than the other actors. I don’t get to fight as much as they do, but dragging yourself, sometimes 100 meters? I did that. It’s just a small transportation scene; I was crawling 10 meters and we had to tape that nine times.After the third or the fourth take, you are destroyed. You need to take your fitness seriously. Yeah, we had one long shot where I’m on his back and I call him a donkey. We did that a few times and he had to carry me for that entire, long take. He was complaining a little bit after that. That was hilarious though. There’s really nothing you can do as an actor—you just need to do it. He’s tired; I’m tired when I’m crawling. But you know, it’s tons of fun. The tone is very light on the set and working with Travis is a lot of fun. We prank each other and have fun with this and that, and we get thought the day even though it’s physically tough. I’ve seen Travis prank people at Comic Con, so I’m imagining him maybe tossing you off his back. [Laughs.] You have no idea. The amount of times he has thrown food at my head. [Laughs.] Well, I get him back. I get him back. And I think he prefers that. I won’t talk any more about it, but it’s been messy. Because Ivar can’t use his lower body at all, you’ve had to change your whole physicality. That must take so much concentration to not move in a way you normally would. Definitely. The most frustrating thing about it is you’re not able to choreograph your own scenes. If you feel you should pour yourself a drink or something like that just to keep the flow going in the scene, you can’t do it. Because Ivar would have settled with the fact that he wouldn’t move. So I can’t do that either. He’s making people do stuff for him, or he’s just not doing anything. And that has been very frustrating, definitely. You’re not allowed to act with your entire body—that’s another big challenge. So you feel like you have to compensate. So you’re acting more with your face, your hands and arms, and a little bit of your upper body. But still you have to remember that you’re in front of a camera, and everything you do there is twice the size on camera than it is in real life. Right? So you have to contain yourself while compensating for the fact that you can’t move around and do what you feel is natural. It’s a huge challenge, but you know, every time it’s a challenge, it makes it tons of fun. It’s such a learning experience. If I remember correctly, when Ivar was a child, Ragnar wasn’t necessarily that nice to him. Still, Ivar now is his biggest defender. Why? Well, I think because Ragnar has never been there [while Ivar was growing up], he still has that image of him as being this great, great man. Every single story of Ragnar has made him great. People have been saying that he’s descended from Odin and all that. Ivar, being very religious because of getting schooled by Floki, really puts a lot of value into that. And who doesn’t need a father, as well? I think he always needed his father because his mother was suffocating him with too much love, and having Floki as a mentor was pretty tough as well, I reckon. And I think it’s hope. When he sees his father return, he sees a new life for himself—he hopes. Maybe something new will happen, and thankfully it does. Tell me about swinging from Ivar’s craziness and ruthlessness to the sadness and vulnerability. Do you prefer one or the other? [Laughs.] Both, definitely. It’s the balance that’s interesting. I’ve done some crazy, crazy scenes where he’s actually mental. … And I love that. I don’t know if I’m melodramatic oriented—I think there’s a little bit of me that is—I really live for the scenes when I get to show the human side of Ivar. The “throne scene” is a good example. And there’s a lot of scenes coming up where you will see Ivar being very human. Most of the time it’s either for himself or only with the few people that he trusts, which is almost no one, really. So you’ll see a very, very, very human side of Ivar later and that’s going to be very interesting. You’ll see a lot of scenes where he’s showing that, definitely. Does he love his brothers? That’s a very good question. I’ve been wondering about that as well. I think he loves Ubbe. The other two are a little bit wishy-washy. But I think he loves Ubbe because Ubbe has been kind of a father figure. But he is the big brother so there’s that brother dynamic as well. Jordan Patrick Smith, who plays Ubbe, and I talked a lot about our relationship. His character is very considerate; he’s the oldest and he’s the one taking care of the family, so to speak, while the father has been away. Ubbe has been the brother who takes the most care of Ivar, and has really been his legs in a way. There’s a little bit of love with the others, but I think also it’s really about Ivar just trying to become one of the brothers. He just wants to become a part of the group. He’s fighting against himself all the time because he’s so extreme and sociopathic in a way. He challenges them all the time because he’s compensating for the [inability to walk]. You see how he’s challenging Sigurd in the first episode. It’s really all just him trying to prove himself. Your Instagram indicates that you are having the time of your life. Would that be fair to say? [Laughs.] I do have the time of my life, definitely. It’s all fun. It’s all good times. I’m spoiled to work on the greatest job in the world, but also with the people that I work with because the crew on “Vikings” is absolutely outstanding. I could not have done any of the stuff that I’ve been doing without them. The amount of help that I’ve received to deliver the performance is all on them. Our lovely crew on “Vikings” is so helpful. And we have such a huge amount of creative freedom. We have a constant dialogue, especially with Micheal Hirst, and he listens to you. You’re part of creating your own character. That is the game changer for this show. I think that makes it way better than it could have been. You like rolling around in the mud and getting blood splattered on you and all that good stuff? Oh, I love it. I absolutely love it. It’s so cool and it looks crazy on the screen. 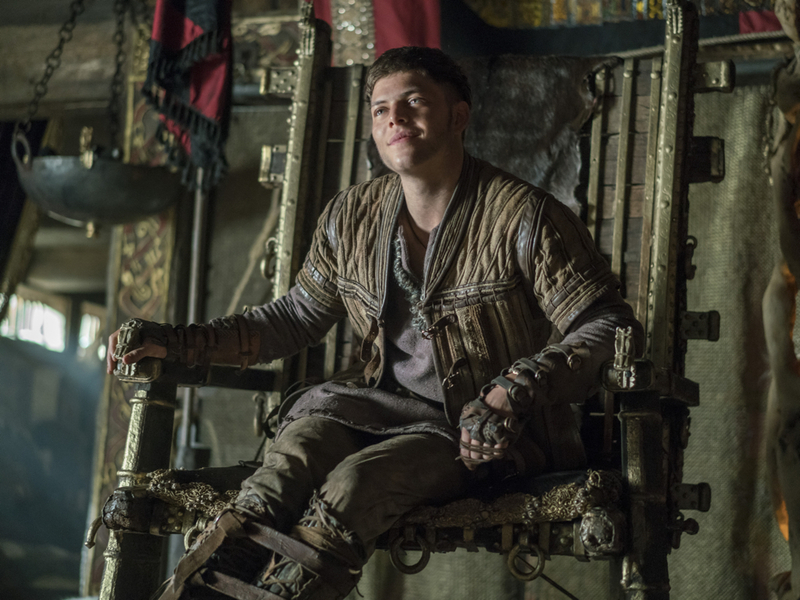 When he’s on the chair he looks like every body else, but every single time Ivar is on the ground it reminds the people what he has been through on a daily basis, right? I love that. I just need to add about your recent Instagram shots: It looks like you’re getting a better hair cut for Season 5. [Laughs.] Well, fair enough. Yes, I do. The story behind that hair cut is that I had almost an Army cut because I did a short film just before I got the part in “Vikings.” The hair stylist didn’t have that much to work with. So we went with something very boyish to make him look like a boy. As the story goes along and he becomes more of a man, he also gets the long hair, the Viking hairstyle. As a Danish person, is it extra special for you to playing this role since the history comes from Scandinavia? That’s the main thing that all the Danish journalists are talking about, which I have not found interesting at all. Because what I’m portraying is not a Dane in particular, but a human being. That’s what I live for and that’s what’s interesting to me. So the connection in that way—no, that’s really not something that I am interested in. I knew a lot of stories because I grew up with them. So in that way it was tons of fun when I researched. But I have to say that I’m portraying a human being, and that’s the main goal.